Investors to be more cautious . It was second straight week of gains for the stock markets. It was second straight week of gains for the stock markets. 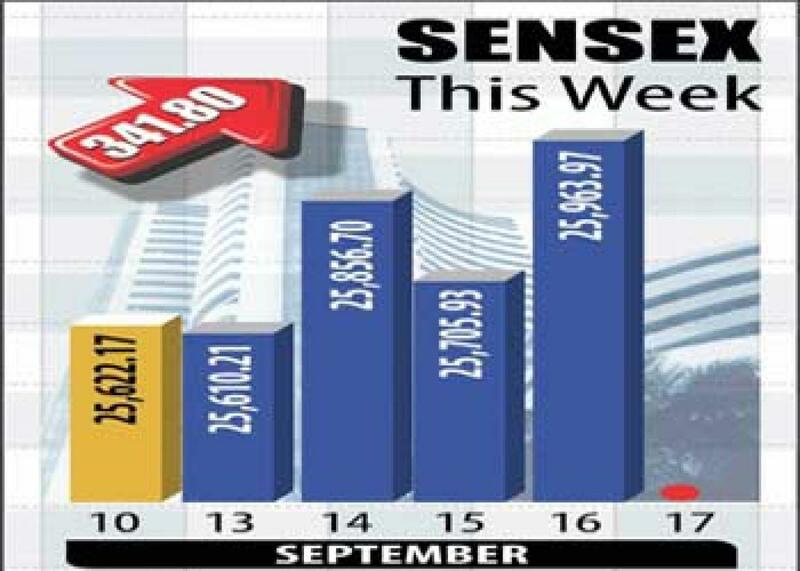 The Sensex had risen by 408 points in the previous week, logged even bigger gain of 609 points this week taking two weeks' total to 1017, thus regaining one third of the 3033 points lost in the preceding four straight weeks of massive fall due to turmoil in the Chinese economy. Besides small and retail investors, who were attracted to stocks at the beaten down prices, even the FIIs turned net buyers from net sellers of Indian equities especially after US's Fed Res Board came out with a decision to not hike the interest rate this time too, on Thursday. The status quo as maintained by the Fed Res in the matter of interest rate raised hopes of the RBI cutting the key policy rates in its bi-monthly review meeting scheduled for September 29, which too was a factor that inspired prospective buyers to take higher risks. The US's central bank did not impose any hike in the interest rate. The markets have jumped by another 255 points on the following day of trading on Friday as the markets had remained officially closed for Ganesh Chaturthi on Thursday. Thus, at the end of the week, the Sensex, not only closed higher by 609 points but also reclaimed 26,000-mark and closed at 26,219. The status quo by Fed, not only inspired fresh buying support for equities but also aided the Indian currency to firm up significantly which too was one of the factors that transformed the FIIs from net sellers into net buyers, especially on Friday. Now all eyes are set on the Reserve Bank of India's policy review meeting scheduled for September 29. As per the hints as already been provided by the Reserve Bank Governor, Raghuram Rajan, he is not very much inclined to cut the rates as the core issues like inflation and others are still not in favour of a rate cut. On the other hand, the government of India and the business fraternity are aggressively demanding a rate cut. Looking at the adamant attitude of the Governor, it will still be a non-happening event this time too. However, even if the RBI cuts the rate, then the markets might react to such action slightly positive but they are unlikely to run up straight as immediately thereafter the new corporate earnings season is scheduled to commence. Besides, the crucial Bihar Vidhansabha polls would arrive and that too could keep the markets under stress. Also, the Fed has only postponed the rate hike, it has not completely ruled it out and therefore, the rate in the US is certainly go up before the year ends in December. The prospective buyers of equities are now required to be more cautious while selecting and preparing a list of good stocks to be picked up in near future. What they need to do is wait for the new corporate earnings season to kick-start and prepare a shopping list after studying major corporate results and then pick up those stocks only when the markets come under pressure due to any external factors.